What Is The Best Martial Arts For Kids To Learn? If you are looking for fun and physical activities for your kids you may have considered enrolling them into a martial arts program. There are many different types of martial arts and if you have no previous experience with one you may find yourself unsure of where to start. The good news is that any discipline of martial arts you choose, you’ve likely made a great choice. In this article we will consider different martial arts for children and help you to determine when and what martial art is best for your child and family. Are Martial Arts Good For Kids? Any parent may find themselves concerned and wonder, is martial arts good for kids? They might worry that learning a martial art may suggest to their child that it is ok to use violence. Thankfully this fear is far from the truth. Martial arts do not promote violence and instead focus strongly on respect and self-discipline. They teach self defence but are strongly against using learned skills to hurt another. In some martial arts gyms an abuse of the martial art can have you removed from the club. Some parents find that children who are at times violent may improve their behaviour after starting to learn a martial art. This is because of the focus put on self-disciple as well as self confidence. Martial art’s aren’t just good for kids, they are great! If you are still concerned about how your child may behave after learning a martial art consider speaking with an instructor and watch a class before bringing your child. You should also talk with other parents about their experiences with Martial Arts to see how their children have benefited from these sports. At What Age Can Kids Start Martial Arts? Martial arts are great for children of any age, but it may be best to not start a Martial Art until they are showing interest in learning. If your child is mimicking Martial Arts and shows interest in it, then it’s probably a great time to get started! Many Martial Arts gyms offer programs for children as your as 4 years old but also have programs for older children and adults. Some may even have parent and kids martial art classes to allow them to learn with each other. Martial Arts gyms come to feel like family over time. Having the whole family learn a martial art is a great way to stay active and bond with your children. Are Martial Arts Safe For Kids? Sparring is a normal part of learning a martial art and it can seem intimidating to parents and children alike. 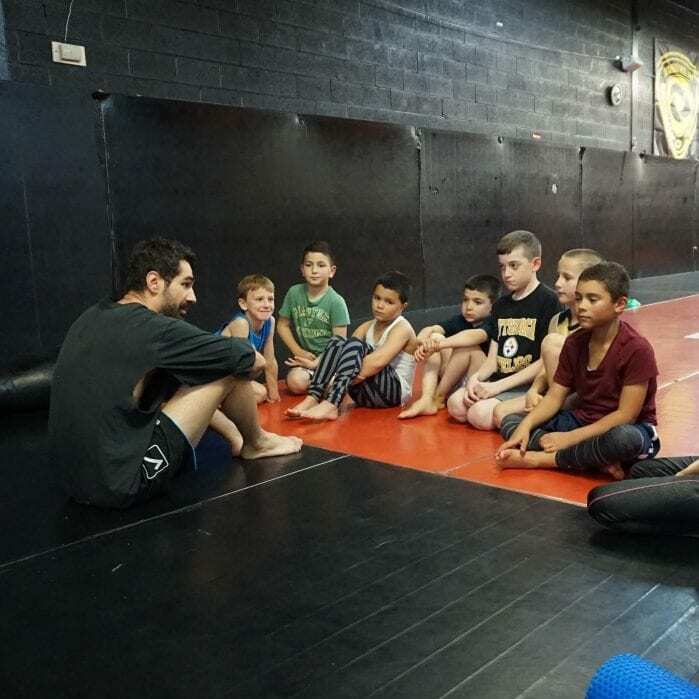 Many gyms do not start with young children sparring but instead allow them to learn techniques and focus on learning new skills. As children learn and become more comfortable they may wish to start sparring. Some martial arts allow for more contact than others. Consider if you would like your child to learn a full contact sport that they can compete in or something to do just for fun. Like any physical activity there is always a risk of injury, even riding a bike can cause bumps and bruises. Talk to your gym about safety and equipment and get educated about what your children will do in class to address any safety concerns you may have. What Is The Best Martial Arts For Kids? There are many different types of martial arts and it can be difficult to decide which one is best for your child to learn. It may be a good idea to check out a variety of different gyms and types of martial arts to help you decide what the best fit for you child will be. Below we have described some of the main differences of popular martial arts to help you determine which one might be the best fit for your child. Karate – A Japanese martial art. It holds an emphasis on hand strike techniques while still using some foot techniques. Throws are also taught in Karate. Karate is not an Olympic sport but can be competitive. Boxing – Boxing is focuses primarily on punches and places a strong value on fitness. Boxing is a western martial art and is practiced by both amateur and professional athletes. Taekwondo – Taekwondo is a Korean martial art. The focus of Taekwondo is kicking and foot techniques. It is currently an Olympic sport. Judo – Judo focuses on throws and submission holds. It is an Olympic sport and is also used by many MMA fighters. ability to introduce many martial art techniques. Any martial art is good for kids but Karate and Taekwondo and MMA are popular choices for beginners. If you think your child may be interested in competing at some point you may want to consider the opportunities available for children to compete at local events and higher-level sport. Most gyms will offer a trial class to new students. Don’t be afraid to try more than one gym and more than one martial art. The one that you child connects with best will likely be obvious to both you and your child. Consider starting with a kids MMA class to get a feel for many different styles at one time. At first, martial arts can be intimidating to children. Make sure when starting any new sport that you take it slow. Be encouraging with your child and listen to how they feel about what they are doing. Martial arts are great for building confidence and self-respect but there is a learning curve. If you are finding that your child does enjoy a sport don’t force the issue. Give them a break and possibly try a new different type of martial art. Try to find a gym that makes physical activity fun and you will be sure to have a little fighter on your hands in no time. Remember that martial arts are not for learning how to be violent but are instead about respect, self-discipline and confidence. Martial arts are great for children and parents alike!